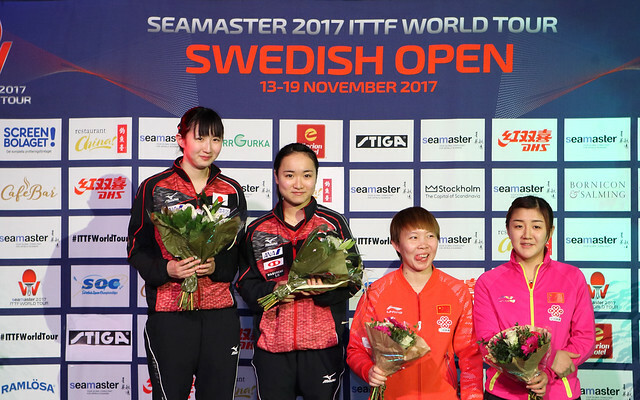 Disappointment for the hosts, conversely there was delight as matters commenced in the first round of the Under 21 Men’s Singles event at the Seamaster 2017 ITTF World Tour Swedish Open in Stockholm on Monday 13th November. The disappointment was that experienced by Anton Källberg, the delight was caused by Simon Soderlund. Anton Källberg, the no.2 seed, was beaten by Hong Kong’s Lee Hon Ming in a full distance five games encounter (5-11, 12-10, 7-11, 11-5, 11-5), the defeat coming after 17 year old Simon Soderlund had recovered from an opening games deficit to overcome Korea’s Park Jeongwoo, the no.11 seed, by a similar margin (4-11, 11-9, 7-11, 11-7, 11-7). Positive and into a rhythm, if any player on the opening morning of action was positive and found rhythm in a split second it was Park Ganghyeon, like Park Jeongwoo from Korea. Ioannos Sgouropoulos of Greece has enjoyed a quite outstanding year; winner of the Junior Boys’ Singles title at the European Youth Championships and more recently successful at the Buenos Aires 2018 Youth Olympic Games Continental Qualification Tournament. He was beaten by the speed of Park Ganghyeon, the no.9 seed (11-8, 11-4, 11-8), not only the electric footwork, also the speed at which the young Korean attacked; left handed, a shake hands grip version of Yoo Namkyu, the first ever Olympic Games Men’s Singles gold medallist, but with a ripping backhand to complete the equation. Devastating from both wings; attacking strokes that made you blink, they gave Ioannos Sgouropoulos no time to react and become involved in rallies. However, watch Park Ganghyeon play near the net, the short play; highly skilled in that area of the game; that also nullified the top spin play of the Greek. Impressive from Park Ganghyeon and there were more impressive performances, especially from Spain’s Miguel Vilchez and Gleb Shamruk of Belarus who both upset the seeding. Miguel Vilchez beat Frenchman Andrea Landrieu, the no.10 seed (13-11, 12-10, 4-11, 12-10); an even greater upset Gleb Shamruk ousted Japan’s Japan’s Tonin Ryuzaki, the no.5 seed (8-11, 11-4, 11-9, 6-11, 11-5). Surprise defeats but not for Korea’s Cho Seungmin, the top seed, nor for Japan’s Mizukl Oikawa, the no.3 seed or Hong Kong’s Lam Siu Hang, the no.4 seed. Cho Seungmin beat Iran’s Amin Ahmadian (13-11, 11-3, 11-5), Mizuki Oikawa accounted for Sweden’s Truls Moregard (11-6, 11-8, 11-9), Lam Siu Hang ended the hopes of Simon Berglund, also from Sweden (11-9, 11-9, 13-11).